The sporangia most easily recognized as such in the Rhynie chert are those of Aglaophyton. They are often split lengthwise (Fig.1), and sometimes a twist in the texture of the wall is distinctly seen. This led to the assumption that the twist might have originated as a result of splitting , as it is known from the seed pods of several leguminous plants, where mechanical stress built up by drying of the ripe pod is released in a sudden burst scattering the seeds and leaving the halves of the empty pod in a twisted state. 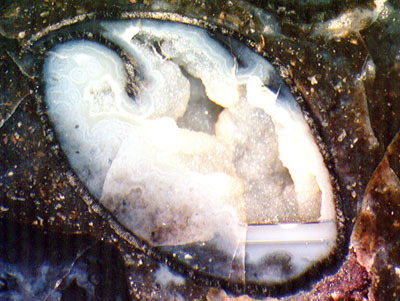 Fig.1 (far left): Cross section of empty Aglaophyton sporangium split lengthwise, sides overlapping, inner wall layers absent owing to decay. Note also the level bands in the cavity. 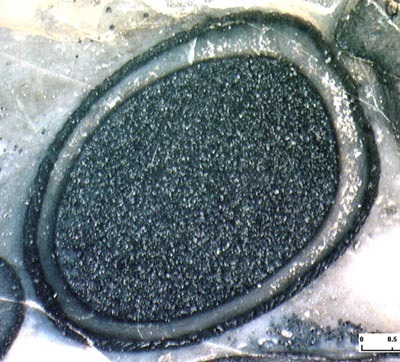 Fig.3: Inclined section of non-split Aglaophyton sporangium whose spiral texture can be inferred from the apparent width of the outer wall cells changing along the circumference. Photographs by H. Sahm. In , an epidermis texture is shown which seems to belong to a sporangium with a left-handed twist, while ours in Fig. 2 is clearly right-handed. This is suspicious since Nature often prefers one type of thread, which suggests the idea that the picture in  had been obtained with the peel technique which gives the mirror image of the real thing and hence transforms right into left hand thread if one does not take care to reverse it before printing. In this connection it is interesting to compare the handedness of other twisted sporangia as they are known from a few more early fossil land plants (Rhynia, Huvenia, Torticaulis) and extant mosses. Sporangia of one species with either handedness are shown in  without any comment on the difference. Apparently the type of twist is not always conserved in the reproduction of pictures in botany but no-one seems to bother. In view of this state of things it will be interesting to find out if the thread of twisted sporangia is equal within one species or among related species so that it could serve as a useful feature in cladistics. * Addendum 2014: The aspect of the cells in Fig.3 hints at an additional asymmetry of the wall texture which is not yet understood. See Rhynie Chert News 65. David S. Edwards : Aglaophyton ... , Bot. J. Linnean Soc. 93(1986), 173-204. P. Kenrick, P.R. Crane : The origin and early diversification of land plants, Smithsonian Institution Press, Washington, 1997.